November 15, 2018 – The Zecca dello Stato (Italian Mint) has released another issue in its “Italy of Arts” series. The majestic Villa Pisani is an imposing dwelling of the 17th century along the enchanting Riviera del Brenta. After hosting doges, kings and emperors, today the “Queen of Venetian villas” is a national museum where 18th and 19th centuries furniture and works of art are conserved. The beautiful façade of the Villa Pisani in Stra. Photo: Patrick Denker / CC BY 2.0. Villa Pisani’s beauty is enhanced by an enchanting garden with its original architecture, ambitious settings and its famous hedge maze, which is one of the most important in Europe. Both the palace as well as the maze are depicted on this latest issue. 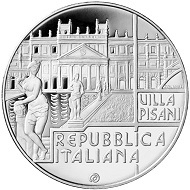 Italy / 5 euros / silver .925 / 18 g / 32 mm / Design: Maria Carmela Colaneri / Mintage: 4,000. 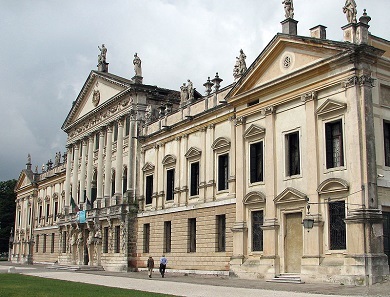 The obverse shows a view of Villa Pisani in Stra (Venice), one of the most famous examples of Venetian Villas along the Riviera del Brenta and an eighteenth-century work by the architects Girolamo Frigimelica-Roberti and Francesco Maria Preti. In the middle, detail of the fountain; upper right, the name of the designer “COLANERI”; below, in two lines, the inscription “VILLA PISANI”; in exergue, in two lines, the inscription “REPUBBLICA ITALIANA”. The reverse shows Villa Pisani’s famous maze, which is made of concentric circles of box hedges and houses, in the middle, a small tower with an external double helical staircase. 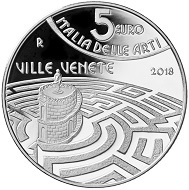 Above, the value “5 EURO” and the inscription “ITALIA DELLE ARTI”; on the left “R”, identifying the Mint of Rome and the inscription “VILLE VENETE“; on the right, the year of issue “2018”. For more information please visit the Zecca dello Stato website. A visit to this beautiful site is highly recommended. Additional information can be obtained on the Villa Pisani website.